The BikeNZ-Pure Black Racing Under-23 team all finished in the peloton on the penultimate stage of the An Post Ras Tour of Ireland today. The four cyclists finished in the main bunch after two riders skipped clear in the final 10kms to claim the major honours, won by Lasse Hansen (DEN), who is second overall in the under-23 battle. Top kiwi hope Pieter Bulling and the hard working Scott Creighton were nvolved in crashes in the final 10kms of the 161km stage from Donegal to Cootehill. 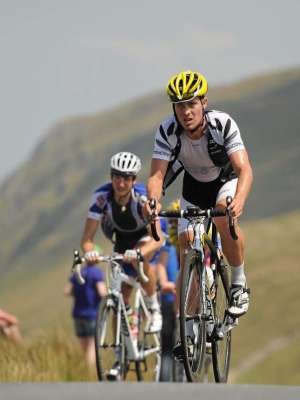 Both riders managed to get back on to the bunch with Bulling remaining in third place in the Under-23 best rider category. The two-man attack went just before the New Zealand team’s planned assault and they missed the opportunity to bridge across to the leading pair. Cameron Karwowski was the best of the team today in 11th place, again prominent in the bunch sprint with the peloton finishing just 12 seconds behind the winner. Frenchman Nicolas Baldo (Atlas Jakroo) retained his overall lead with Bulling best placed of the team in 26th place, 5m26s down on the yellow jersey. Tomorrow’s final stage is 139kms with five category three climbs before finishing with a two lap circuit in the now traditional finish at Skerries, on the east coast north of Dublin. Results, An Post Ras Tour of Ireland, stage 7, 161km Donegal to Cootehill: lasse Hansen (DEN, Blue Water) 4L13.21, 1; Kai Exner (GER, Bike Aid) at 7 sec, 2; Sam Bennett (IEL) An Post Sean Kelly) at 12 sec, 3. Also New Zealanders: Cameron Karwowski at 12 sec, 11; Taylor gunman same time, 41; Scott Creighton same time, 69; Piet Bulling same time, 89. General classification after 7 stages: Nicolas Baldo (FRA, Atlas Jakroo) 23:40.01, 1; Thomas Rostollan (FRA) Aix En Provence) at 13 sec, 2; Martin Hunai (CZE, AC Sparta) at 17 sec, 3. Also: Bulling at 5:26, 26; Gunman at 9:56, 35; Creighton at 21:37, 51; Karwowski at 21:45, 52. Under-23: Richard Handley (GBR) 23:40.19, 1; Hansen at 4:18, 2; Bulling at 5:08, 3. Also: Gunman at 9:38, 8.